Angelique Tassistro makes work into play. Her belief in the magic of creativity, along with her childhood mispronunciation, turned imagination into “magic nation.” Angelique is a ceramic artist who focuses on functional, whimsical pottery with a sculptural approach, always going to that “magic nation” for inspiration. Angelique grew up in Baton Rouge, Louisiana and currently lives and works in Asheville, North Carolina. She received two BAs from Louisiana State University in 2000 in Ceramics and Photography. Her work is shown in the permanent collection at New Orleans Museum of Modern Art in New Orleans, Louisiana. In 2010 Angelique was selected to be one of The WNC Top 10 Emerging artist. 2010 also brought a feature article in The Laurel of Asheville Magazine. 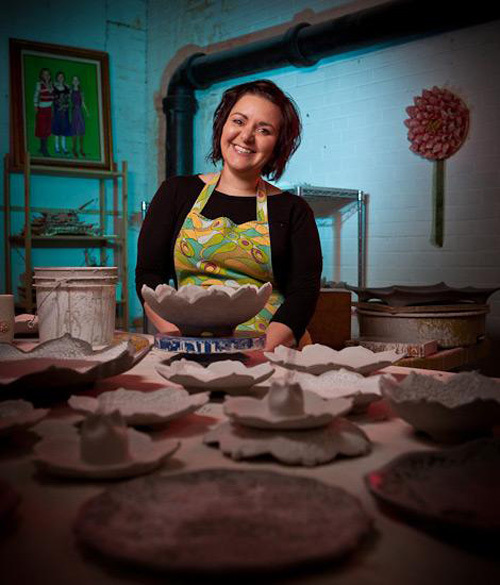 In May, 2011, Angelique was chosen in Ceramics Monthly’s national competition as one of fifteen emerging artists. Angelique is the founder Fly Coop Studios, re-launched in 2010, introducing a new line of functional ceramic pottery and decorative ceramic flowers. Her studio is open to the public and is located in the Asheville’s River Arts District.